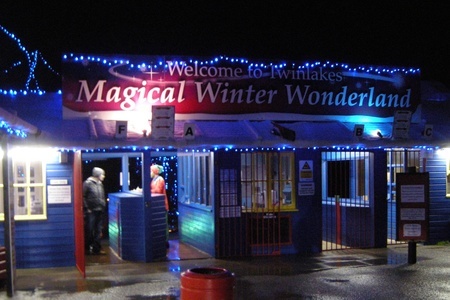 The Magical Winter Wonderland at Twinlakes Theme Park provides all the usual Theme Park attractions with an visit from Santa and some added Christmas special features. This is the second time we have visited Twinlakes. 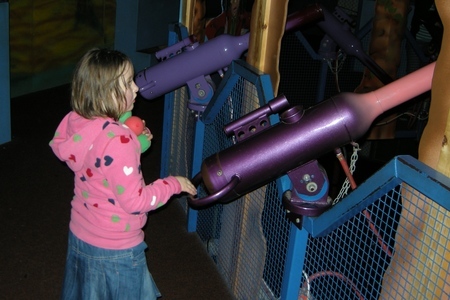 Our previous visit was during spring (previous visit to Twinlakes Theme Park) which we enjoyed. Whilst some of the theme parks with Santa special events required pre-booking at Twinlakes we just turned up and paid at the gate. We could have saved a little by purchasing the tickets online beforehand, but there were no problems with queues to buy tickets. It does mean that we didn't have a reserved time to visit Santa, but meant that we had the flexibility to visit the grotto when it suited us. The admission price to the park was a little less than it usually is, but there was then an additional charge to visit Santa and receive a present. We arrived just before 11am, about an hour after the park opened on a Sunday in December two weeks before Christmas. We anticipated that Santa would be popular so went to see him first. There was a queue which was indoors and took about 15 minutes before we were able to see Santa. This wasn't too bad a wait and at least it was dry. The queuing area had been Christmas themed which helped stopped the children becoming too bored. I overhead people later complaining about the wait time, but I don't know if the queue got any worse later in the day. This was the only queue we had during our entire day out at Twinlakes! The presents from Santa were very good, and were worth more than we had paid for the visit to Santa. We had a 3 year old boy and a 6 year old girl. The boy present was particularly good. The kart track had been re-branded as a ski-hire cabin where you could try roller-skis. Both my kids wanted to have a go. I was walking along helping them. My first thought was that it was going to be hard work, but my daughter soon got the hang of it and was able to ski around with minimal help, leaving me to help my son go around. This certainly added something a bit different and helped with the Christmas theme. The other Christmas type outdoor ride is the sledging. This is something that is a permanent feature. It is like a dry slope ski run, but with channels to keep the rubber-ring sledges into their own tracks. Great fun for the kids. We had some dry weather and we went on some of the outdoor rides. I was pleasantly surprised to find that almost all of the outdoor rides were running. Whilst I expected the roller-coasters to be running I didn't really expect the bumper boats and log flume to be running, the weather was fairly mild (for December) so the log flume wasn't too bad in the cold. We didn't go look whether they Pedalo boats were running but I guessed they wouldn't be. The one ride that we didn't get to go on, was the Iron Moose Express train. I knew from our previous visit that there were only limited times that the train was running, but didn't really know what those times were. We went and looked at one station during the afternoon, but it was showing next ride as 1pm so I guess we missed the last ride. This is one thing that was a little disappointing as we would have liked to have gone on that and it's a ride that the whole family can go on. One of the great things about Twinlakes is that there are a good number of rides that are indoors. In most cases these are the smaller rides (for obvious reasons), but it included plenty of rides for our children. This worked quite well as the rain started to fall during the afternoon when we'd gone inside. There are also some great play areas indoors including the Gladiators Colosseum Play Area (with lots of slides rope bridges and soft play), Master Blaster (fire sponge balls at targets or each other) and a special Snowman ball play area. These are great fun and not just for the kids. I enjoyed climbing over the rope bridges and taking my son down the slides. It's a fun way to get active and easily equivalent to a good work out at the gym (just remember to take a child along with you). One good thing about Twinlakes is that as well as being able to buy food to eat inside they also provide indoor picnic areas to eat your own food. On this occasion we ate at the fast food outlet in one of the main buildings. As well as having the usual fast-food they also had some more healthy options (eg. Jacket Potatoes) at the same place which is better than having to go to different places to eat. The chilli in the jacket potato appeared to be home-made and I do recommend that one. We ate quite early (just before 12 noon) and didn't have any problems finding a table, but later the tables were all full. This was mainly because people were using them as a base whilst children were off playing on the rides rather than people eating. There were a couple of party times, based around a disco setup in on of the buildings. From what I could tell this appeared to be just one game of musical chairs to Christmas music. 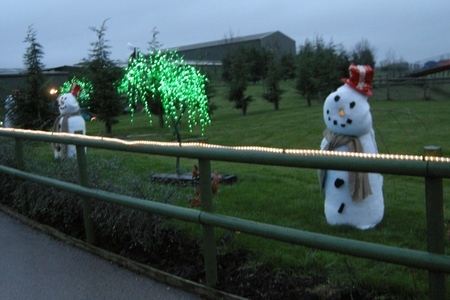 There were lots of Christmas decorations around the site. These were not up to the same standard as Centre Parcs at Christmas or at Disneyland Paris that we have visited over the last couple of years, but they were enough for my young children who were happy that this was suitably decorated for Christmas. Considering the budget that Twinlakes must have compared with those it was as you would expect. Of course if I'm going to compare it with Disneyland Paris then you have to factor in the very long queues (some of which were 1 hour+) compared to the non-existent queues for the rides at Twinlakes. I did consider some alternatives before visiting. Thomas Land is a favourite with my kids, but is much more expensive and is something we have done before: Video review - Christmas at Thomas Land in Drayton Manor. We also looked at Gulliver's Kingdom, which is a little more expensive, but includes more in the package (a variety of packages available, including meals etc.). The down sides of Gullivers is that it needs to be booked in advance and I was concerned about bad weather spoiling a visit there, whereas I knew that there would still be plenty to do at Twinlakes in bad weather. As a Winter day out on a budget Twinlakes is a real winner. 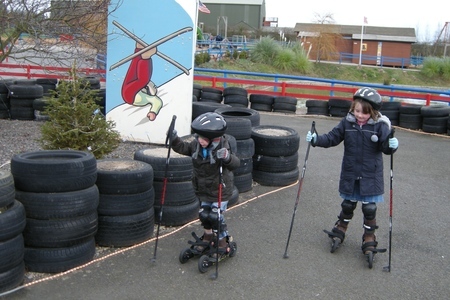 The kids had a great time and I felt that we'd had excellent value for money. There may be some places that are a bit better, but they cost much more and are not necessarily as good during the bad weather that we had. The lack of queues was great and meant that we got great value for money due to the number of rides we were able to go on. I'd definitely recommend a visit to Twinlakes. A good selection of rides for children and the indoor play areas are the best I've seen in any theme park. My only complaint would be that the train finishes too soon and we didn't get chance to have a ride. The Christmas decorations are fairly good and the visit to Santa was great value. If we lived a bit closer I would have got season tickets for next year, but it's a bit too far for us to visit regularly.